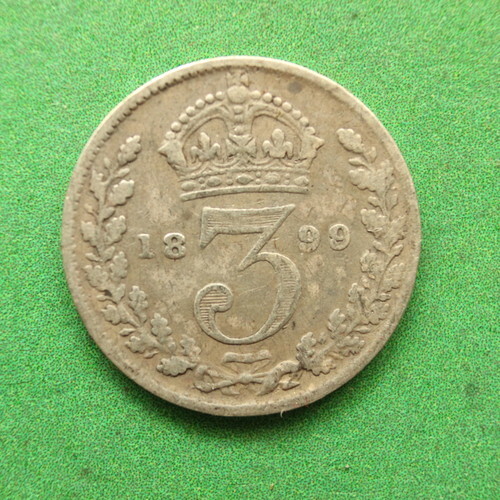 It's an 1899 British silver threepence. 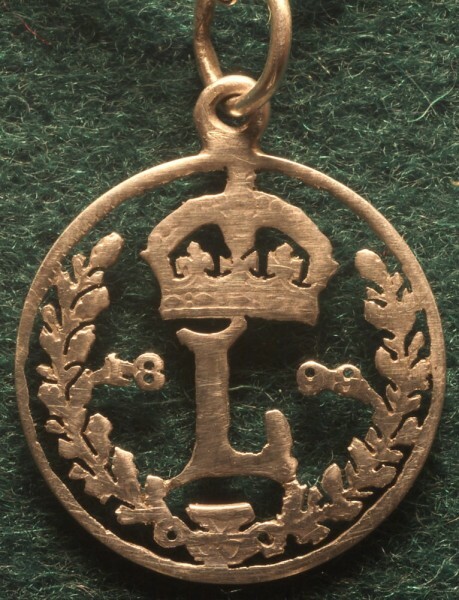 Because it was minted before 1920 it's made from sterling silver, which is 92.5% silver, 7.5% copper (the alloy makes it a bit harder-wearing than pure silver would be). I also made the attachment rings from sterling silver wire and soldered them on with silver-solder, and supplied it with a fine sterling silver chain (not made by me). I cut it out by hand using very small diameter drill bits, a jeweller's piercing saw with a ridiculously fine blade, and a pair of Optivisor magnifying glasses. I couldn't have done the work without decent magnification - often I would spend a few minutes obsessing over a particular detail, then flip the visor up and look at the work I'd just done, only to find that I could barely see the feature with my naked eyes. It's slightly frustrating to look at a photo of the finished coin taken with my macro camera setup because it shows up flaws that you just can't see without magnification. I think I definitely got better at following the lines accurately after a few hours' practice. In hindsight I over-polished parts of it, particularly the crown, removing some of the fine details. But for a first attempt I'm quite pleased with it! Incidentally, Christmas is coming up: if any of you are interested in commissioning me to make something similar, please drop me a line to discuss the details. No wonder your relative is reportedly "over the moon with it" :) I'm very interested in the design challenges presented by this type of project, as well as the challenges of craftsmanship. The first designs I saw were simply cut-outs of the existing coin design, then I found pictures of some cut coin designs that incorporated other shapes, which gave me the idea of replacing the denomination with an initial. It took a while to find a character that I liked the shape of (the 'L' I went with is inspired by the one from Linotype Victorian Regular). Then I had to decide on the exact size and positioning and add 'tabs' in appropriate places so the letter wouldn't fall out. That was a little tricky because if you get the tabs wrong they look very obvious (e.g. I initially considered putting two tabs at the top of the L but that looked pretty bad). I had to make similar decisions about where and how many tabs to leave to hold together the existing design elements. Too few or too far apart and the piece would be weak and easily bent. Too many and the design loses its delicacy. I think I struck the balance pretty well there. The parts that hold the numbers on are the least satisfactory, but I was limited by the original positioning of the numbers. I tried to make the numbers look like organic extensions of the leaves rather than perfectly horizontal bars. The next challenge was deciding which features are just too small to even attempt to cut out, for example the lower sections of the '9's were smaller than my smallest drill bit (and a round hole would have made them look like '8's) so I left them solid. The frilly edges of the leaves were too fine to cut exactly - the best I could manage was to give the leaves a slightly serrated edge. The two drilled holes near the bottom were one of the places where I think I went too far - the round holes look worse than if I'd left the stamped features alone. The features inside the crown I did fairly early on and I think it shows - the work I was doing on the leaves after a few hours practice was quite a bit more accurate. Drilling the holes was trickier than you might think. The holes are tiny, and in several places there was almost no margin for error - a fraction of a mm away from where I meant it to be would be very obvious. I used a specially ground very fine-point centre punch and a Minicraft drill on a stand (in the past I've used this setup to drill hundreds of holes in home-made PCBs). This proved a bit clumsier than I would have liked and I broke one drill bit. The sawing was mostly a matter of magnification and strong light so I could see what I was doing, and going slowly and carefully. I broke the blade a few times (luckily when you break a full-length blade you can usually put one of the broken sections back in the saw frame). One tricky thing was that I had to hold my head at a weird angle to avoid hitting the saw frame on the Optivisor. I also found I had to be constantly blowing the sawdust away so I could see the line I was following. That is really quite amazing. How clever. It must have taken you ages. Thanks! I wasn't keeping close track but I reckon the design took about an hour, the cutting about six hours, the attachment ring about half an hour, and the cleaning and polishing about an hour. Not counting research, searching eBay for the right coin, ordering materials and tools, etc. I reckon a second one to a similar design would probably take me about six hours. A simpler design (without the laurel wreath) would likely take significantly less.